How many Internet-connected devices do you have in your home? I am surrounded by around 25 such devices. It’s not just your PC, smartphone, and tablet that are connected to the Internet. Today our homes are filled with tiny computers embedded in everything from security cameras, TVs and refrigerators to thermostat and door locks. However, when it comes to security, people generally ignore to protect all these connected devices and focus on securing their PCs and smartphones with a good antivirus software or a firewall application. What if any of these connected devices, that are poorly configured or insecure by design, get hacked? It would give hackers unauthorized access to your whole network allowing them to compromise other devices connected to the same network, spy on your activities and steal sensitive information by using various sophisticated hacks. There have already been numerous cases of attackers hacking home appliances, industrial control, automotive, medical equipment, utility systems — thanks to the insecure Internet of Things (IoT). IoT threats have risen enormously in past few months, especially DDoS-based botnets and ransomware attacks, which have shaken the digital world. 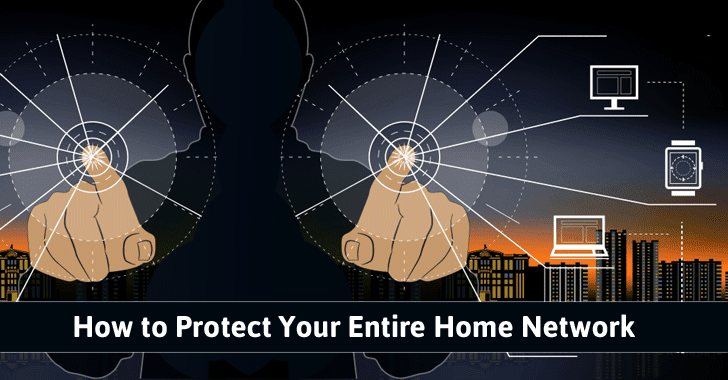 Can You Protect Your Entire Home Network? While IoT manufacturers and Internet standard creators have a huge role to play in securing these vulnerable devices, consumers must also take some personal responsibility in protecting their own devices. There are numerous security articles available on the Internet providing useful recommendations for securing your smart devices. But when it comes to manually protecting all IoT security issues, it is not possible for all users, especially non-techies, to understand and fix them in with no time or effort. Moreover, it is also annoying to regular check and update every single device. So, there’s a sure shot solution to all your issues — Bitdefender BOX. The new Bitdefender BOX is a tiny hardware-based security solution which is being designed in a way that includes network firewall, intrusion prevention system, vulnerability scanner and an antivirus solution. Setting up the Bitdefender BOX is quite easy. This tiny box can be connected to your existing internet router to monitor all the Internet traffic and connected devices in real-time, preventing unauthorized access to your home network. Once connected, Bitdefender BOX automatically scans your network and makes a list of everything that is connected to it in order to protect and monitor things. To identify known malicious patterns designed to disrupt or spy on you, Bitdefender BOX continually intercepts and scans for only essential parts of the data packets that flow in and out of your network. One of the major benefits of Bitdefender BOX is that it automatically keeps an eye on every device that joins your network, whether it be you, a guest, or hacker. When a new device logs into your network, Bitdefender BOX automatically alerts you with a pop-up on your phone, allowing you to quickly kick malicious users off your network with just a single tap. Bitdefender BOX also provides antivirus protection via Bitdefender’s cloud-based threat intelligence network for every device on your network, alerting you to every attempted intrusion or malware that comes from the Internet. Bitdefender’s Total Security Multi-Device (TSMD) is a complete cyber security solution that protects your standard devices – laptops, desktops, smartphones and tablets – across Windows, Mac OS, and Android platforms. Bitdefender BOX comes with a one-year subscription to TSMD, as well as the freedom to deploy it to an unlimited number of devices. That means you can protect every classic device in your network – all with this powerful, award-winning software. However, what if you are not at home within the range of your home network? Don’t worry about it, because Bitdefender BOX will secure your device remotely outside of the range using a VPN (virtual private network) connection between the agent and BOX, routing all your traffic and analyzing it for any threat. Bitdefender BOX also protects all your connected devices from man-in-the-middle (MITM) and other cyber-attacks when you connect to insecure networks, such as public Wi-Fi hotspots. Bitdefender BOX also has Ransomware protection built in, protecting your network from ransomware attacks. Ransomware is a nasty program that locks your files and asks you ransom to be paid in Bitcoins, which is the only way to get back your files. Bitdefender BOX also comes with a vulnerability scanner that scans every device on your home network to find any weak spots that can compromise the integrity of the network. Bitdefender BOX checks for your password strength, firmware version and any vulnerability that can be used as a backdoor to gain remote access or unauthorized access to your connected devices or network equipment, steal your data or launch attacks. If you want to review the status of your connected devices and address detected issues, just click the Vulnerable Devices button in the BOX app and keep your network safe. Want more? The BOX can also smell a rat. Yes, this little gadget also notices the suspicious behavior of any device on your network and protects other devices on the same network from unauthorized access and tampering. Most behavioral security solutions are usually designed for large, highly distributed networks run by large organizations and government agencies, but Bitdefender BOX brings the same level of security for your home network. Bitdefender Active Threat Control has been designed to detect never-before-seen threats and classify advanced malware, including variants of known and unknown threat families, in real-time using machine learning and behavior-based threat analysis and improves security and privacy of your connected devices. Bitdefender BOX – Should You Buy It? With these impressive features, Bitdefender BOX is a win-win product for your smart home network, which guards and protects your home environment from every single threat, whether it’s a hacker, malware, an intruder or a guest. The BOX supports all devices running iOS 9 and later, Android 4.1 and later and Windows 7 (SP1) and later (32 and 64 bit). Usually, Bitdefender BOX comes at $199, but the company is currently offering a $70 discount. So, you can buy it at $129. Bitdefender BOX is well worth every single penny for those who want security protection for all of their devices, including smart home gadgets, plus antivirus for PCs, Mac and Android. 1. Change Default Passwords: If you have got any internet-connected device at home or work, change your credentials if it still uses default ones. Changing those passwords periodically is also not a bad idea. 2. Disable Universal Plug-and-Play (UPnP): UPnP comes enabled by default on every internet-connected device, creating a hole in your router’s security that could allow malware to infiltrate any part of your local network. So, check for "Universal Plug and Play" features and turn them OFF. 3. Disable Remote Management through Telnet: Go into your router’s settings and disable Remote Management Protocol, specifically through Telnet, because this protocol is used for allowing one computer to control another from a remote location. It has also been used in previous Mirai attacks. 4. Check for Software Updates and Patches: Last but not the least, always keep your internet-connected devices and routers up-to-date with the latest vendor firmware. Don’t forget that it is every single customer’s job in the entire IoT devices chain to be responsible for the security of their point of connection as well as beyond. Moreover, when it comes to small-area or city-wide IoT implementations, anything connected to the Internet must be secured before bringing onto the network.